Backyard bird watchers in Atlantic Canada have a CWHC research team to thank for practical tips on saving their feathered friends from a deadly parasite. It comes down to managing their bird feeders. 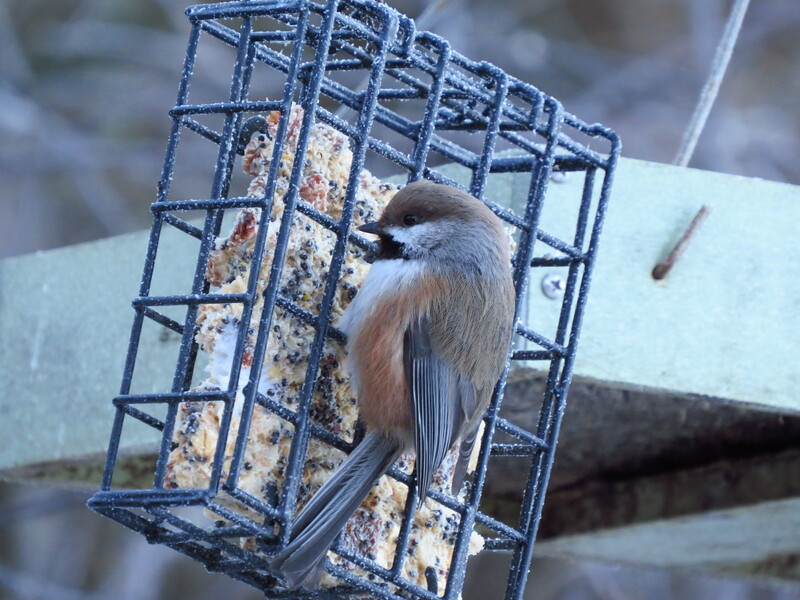 Boreal chickadee at suet feeder. “If you can come up with suitable management recommendations to mitigate a disease or prevent a disease and have the public participate in doing that, you’ve struck gold,” says wildlife pathologist Dr. Scott McBurney. 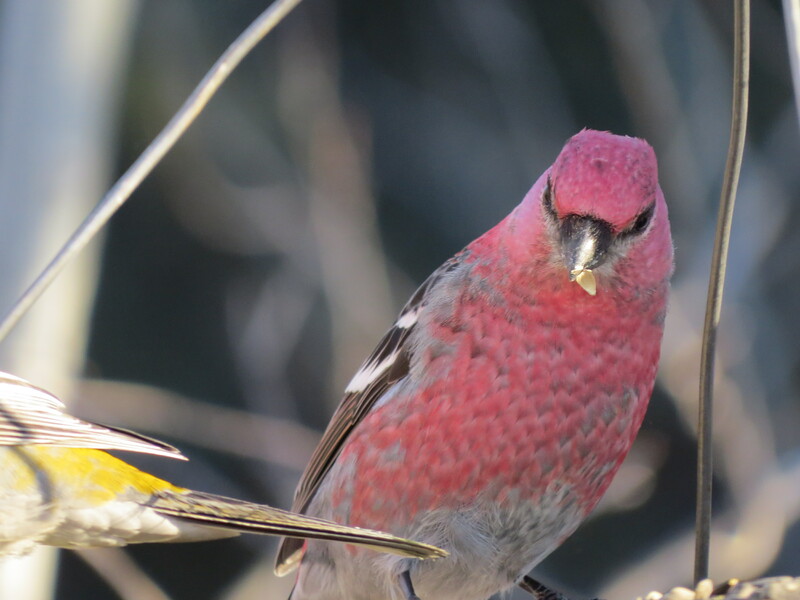 The investigation began after several property owners in the Maritime provinces experienced mortality in purple finches and American goldfinches at their feeders, explains McBurney. At one affected site, swabbing the bird feed taken from those feeders, the team was able to culture the parasite Trichomonas galliane. This microscopic parasite causes an infectious disease called trichomonosis (also known as trichomoniasis) in many bird species. Trichomonosis causes severe damage to the tissues of the mouth, throat, crop and esophagus in affected birds, making it difficult for them to swallow food or water. The researchers’ discovery made them start to connect the dots. “Okay, if the bird feed contains this parasite, could that be a way for it to be transmitted from bird to bird indirectly?” McBurney says. Through experimentation, they found the parasite died in clean water and in dry bird seed. But in moist bird seed, the parasite survived for 24 to 48 hours. These findings led to recommendations for the public to prevent trichomonosis at their backyard feeding stations. The researchers advised that bird seed should be kept dry by only using feeders that keep moisture away from the seed. They also discouraged the use of table feeders because they’re exposed to the elements and their design enables birds to stand among the feed. Pine grosbeak feeding at table feeder. If deaths from trichomonosis appear to be happening regularly on someone’s property, McBurney suggests it’s best to remove bird feeders for a week or two to disperse the birds. He explains that bringing birds with trichomonosis together with non-affected birds can help spread the illness among healthy individuals. He also points out that the disease’s spread may not be directly related to the feed since there might be some other natural feature on the property where disease transmission is occurring. For example, some birds in the area may be drinking from muddy puddles where the parasite is known to survive. Dispersing the birds may get them away from this source of contamination until it dries up. As well, McBurney says pigeons and doves may be contaminating bird feeders since these species have a long history as carriers of the parasite. His team has been able to isolate the epidemic strain of the parasite from purple finches and American goldfinches with trichomonosis as well as from healthy-looking rock pigeons in the region. Using bird feeders that discourage rock pigeons from using the same feeders as finches is another way that the public can prevent transmission of this disease between the two bird species. A paper highlighting the work of graduate student Whitney Kelly-Clark on this topic is to be published soon in the international journal Avian Diseases. In addition to their work in dealing with trichomonosis, the CWHC team’s efforts have led to several other significant initiatives such as the study of avian reovirus infections that have caused winter mortality events in eastern Canadian populations of American crows. Kathy Fitzpatrick is a freelance journalist in Saskatoon. Born in Manitoba, she has spent close to four decades working in media — including radio, television, print and digital.